In real life, pistes change gradient as you go down them, have bumps in the snow, go round corners, slant to one side, and many other things that the examples on this site generally do not show. Therefore it is important to realise this, and have an idea what you can do to counteract the effects these can have. Gradient changes have been covered in other areas of the website. There are a few important things to note about gradient changes. Firstly the steeper a slope is the faster you will go and accelerate if you are pointing down the slope, so you need to compensate for this with your skiing. A lot of people traverse across the steeper parts of slopes and then make their turns on the flatter parts if it's possible. Another thing to take into account is how the stance changes with gradient. 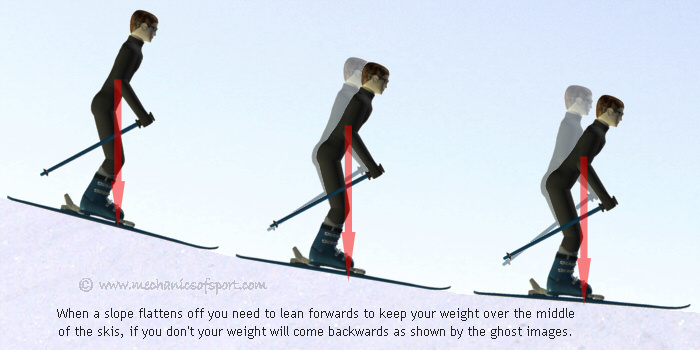 When going straight down a slope you will need to move your weight forwards and backwards to keep you weight over the middle of the skis lengthways and compensate for gradient changes. When traversing across the slope, the uphill ski will become higher or lower as the gradient changes. This makes the uphill ski come further or less ahead of the downhill ski, which the upper body should adjust to, to stay in line with the ski tips and keep the correct stance. To deal with a slant is very simple really, all it really means is that instead of you wanting to go straight down a slope to follow the piste, you need to go slightly across a slope to follow the piste. Therefore you need to traverse a bit more in one direction than the other. As for the your skiing technique, there is no difference as all that has changed is the overall direction that you want to go in. Corners work in the same way as slants, as again all that really changes is the direction that you want to go in. Except with corners the direction keeps changing depending on where you are. Bumps can effect manoeuvres in many different ways, but the most important thing to realise is that they basically change the local properties of the slope. They can make bits steeper or flatter, and the snow can be softer or more icy. The next thing to realise is that there can be several condition changes within the length of your skis, and this must be allowed for. 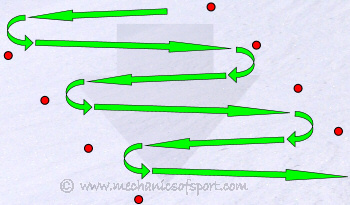 If you are trying to start a turn but the front of the skis is in a soft patch, and the back of the skis are on a sheet of ice, you are going to find it very difficult to start the turn, as the front of the skis are going to want to move a lot less than the back. The trick to generally deal with the problems that bumps create, is not so much, how to counteract the effects they have, but to pick out where you make your manoeuvres better, so that you avoid them. Learning how to counteract certain situations will have to be done, but are not covered on the site, as there are too many variables. If you understand how the mechanics work that have been explained on this site though, you should find it pretty easy to work out yourself. On real pistes snow and weather conditions can make a big difference as well, these have been covered in the snow and weather conditions section. On to the page about Snowboarders.